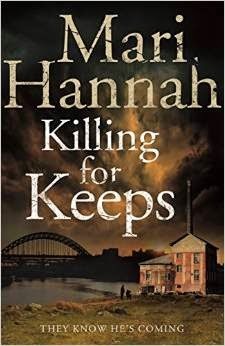 KILLING FOR KEEPS is the latest book by Mari Hannah and features her wonderful female DCI, Kate Daniels. True to form, Hannah does not disappoint and the opening pages of the book introduce you to the story in such a gruesomely shocking way that they have you, drawn in and captivated, right from the start. Some books take a while to warm up but this one is the complete opposite and punches you in the face right away. You have no choice but to carry on reading. Awesome! This is the second of Hannah’s books that I have read and this one is even better than the first. In brief, the book opens with two grisly murders. The lifeless bodies of two brothers, or what remains of them, are found with various parts missing – one on the road under a van and the other on a hospital trolley - and DCI Daniels is called in to serve justice. Luck is not on her side. Although she quickly discovers the identity of the two men, the case quickly stagnates and she is pushed to her limit in order to get things moving again. Chasing her prime suspects takes her from her Tyneside home turf up to Glasgow and even out to Spain and at times both she and her readers feel as if the case will end up being left unsolved. With more lives at stake and the body count increasing, Kate must dig deep in order to save her own life as well as her career, and bring the guilty party home. KILLING FOR KEEPS is a must-read if you like your crime fiction unpredictable and nasty but also enjoy good, solid characters that don’t back away when things start to get difficult. DCI Kate Daniels is one of those tough nuts that will hang on to something until the bitter end. I have my fingers crossed that her love life works out soon and can’t wait for her next case!